This post is written by sister Rafia. It's an activity to do with your child to teach about personal space, something that all children need to know. 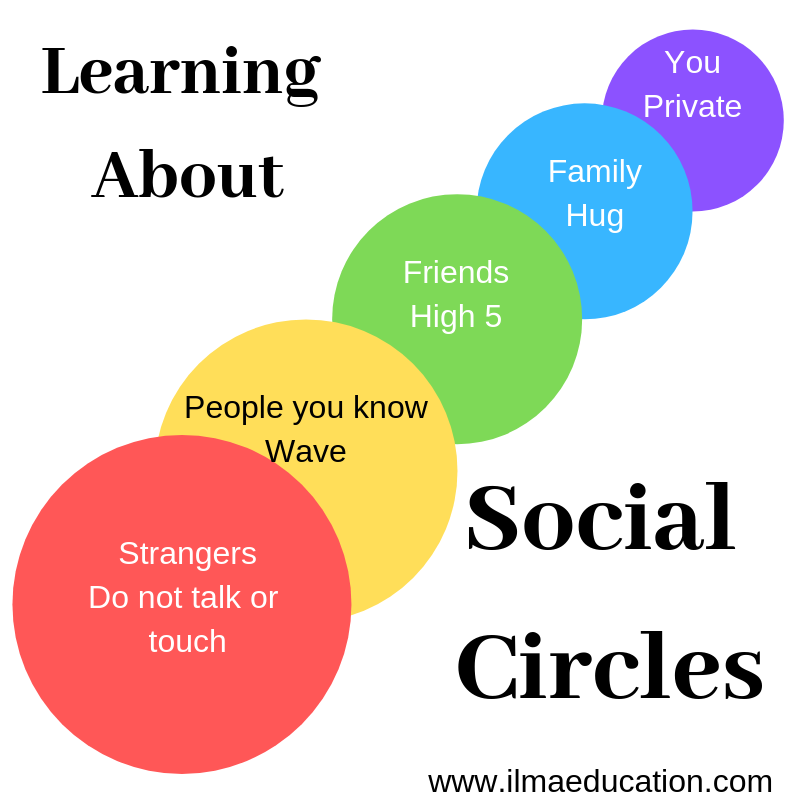 ‘My Social Circles’ is an activity that I recommend every parent to do with their child. It is such a multipurpose tool to teach them about personal space, social distance, appropriate social interaction, body safety, stranger safety and safe/unsafe touch. Statistics show that 77% of parents don’t feel confident speaking to their children about abuse awareness and body safety strategies. But fun interactive activities like these make it simpler and easier to break the ice on such concepts with your child. Chart papers in 5 different colours. Cut them out in circles, each bigger than the next, as shown. Photos of the child, family members, friends, neighbours, helpers, and strangers (you can print pictures of random people off the internet). Limit these photographs to only those people that your children encounter on a regular basis. This activity is best done on a child’s bedroom wall or the back of their bedroom door so you can refer to it and reinforce appropriate social distance and touch from time to time. Help your child in cutting the chartpapers, and pasting photos in the correct circles. You can help them with a hand on hand prompt, if required. This will keep you both engaged, keep the conversation flowing and provide plenty of opportunities to work on their speech and language too! The smallest circle is you. Let’s put your photo in this one. What’s the blue circle? It says, ‘Family’. Which photos can we paste here? Let them have a think, and come up with mommy, daddy, and siblings’ names. These are all the people you can give hugs. You can repeat the same sort of questions for aunts, uncles, and cousins that they see on a regular basis, if you want to include them. What colour is the next circle? Yes, green! Green is for Friends. Hmmm, who are your friends. Let’s find out photos of your friends from here. With friends, we high five! These can include family friends and cousins that they have regular play dates with and their close friends in the classroom. What colour is the next circle? That’s right, yellow! Yellow is for all other people you know. Let’s look at their photos. There’s Mary (housekeeper), Aunty Salma (neighbor), Usman (driver), Dr Tahir (paediatrician), Hassan (guard), and Uncle Ali (father’s friend). We only wave at people in the yellow box. This circle consists of acquaintances such as neighbours, and helpers that the child comes across frequently. And what’s the red circle? It says… Strangers. Strangers are people we don’t know. We don’t know their name. We don’t talk to strangers, unless mommy or daddy are with us. Like all these people (show them photos of random people). Let’s paste them all in the Strangers circle. Practice these ‘social circles’ in daily life as well. Rayan (sibling) is family… and Dada is…. Give them a moment to come up with the answer. If they can’t, show them on “My Social Circles” artwork to give a visual cue. How do we greet Hassan (guard)? Yes, he is in the yellow circle. Show them a few strangers when you are out in the marketplace or in a park. We don’t know that woman. She is a stranger. Can you talk to strangers? No…. only if I am with mommy or daddy. Practice saying this answer with them a few times. Once they have internalized “My Social Circles” program, they will be able to generalize it to other social situations. If the driver goes in for a hug in your absence, for example, it will strike them as ‘unsafe’ and they will come and let you know. If a stranger calls out to them in a park, they will first look for you for approval. The advantages are immense. I encourage all parents to implement ‘My Social Circles’ program in their homes. I would love to hear your feedback! If you hit any roadblocks, or need answers to any questions or confusions, please feel free to write to me. Rafia is an Early Intervention Specialist with seven years of experience working with children with additional challenges. Throughout her career she has supported children in developing their academic, sensory, social and communication skills, and overcoming challenging behaviours. Her experience ranges from one-on-one sessions in the home environment to classroom settings in inclusive schools and early intervention centers. For more on children's personal safety, read 'Stangers: A Safety Guide'.